Holyrood's outgoing Presiding Officer George Reid is set to be awarded the freedom of Clackmannanshire at a special dinner this week. The council's highest accolade is being given to the politician in recognition of his "loyalty" to the area. Mr Reid, whose family have lived in the "Wee County" since the 18th Century, will receive the award at a dinner in Alloa Town Hall on Thursday 18 April. 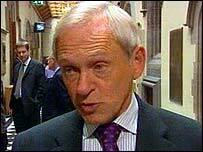 The former Nationalist MP was born in Tullibody in 1939. Speaking of his pride at being given the award, Mr Reid said: "It has been my greatest privilege to serve the community from which I come. "As a Wee County boy, born and bred, I am truly honoured by this award." The council said the Ochil MSP's decision to stand down in May presented the perfect opportunity to recognise his record of achievement. Provost Derek Stewart paid tribute to Mr Reid, whose earliest recorded ancestor, John Reid, was a shepherd in Muckhart in Clackmannanshire in the 18th Century. He said: "For people in Clackmannanshire what is perhaps most significant is his loyalty to the county and the unfailing enthusiasm he has demonstrated for promoting its interests. "He is certainly one of the great Scots of our generation and we are incredibly proud that he is from the Wee County."